Be sure to check out Kim's blog for a second giveaway opportunity today. aCloset.com is a fun online shop with an eclectic east meets west flavor. 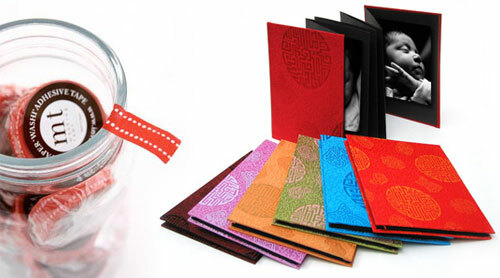 One person will receive a great package that includes a Silk-Covered Accordion Album with photo corners, a very cool Masking Tape from LInvite (Red Dots print), and 3 sticker sheets. 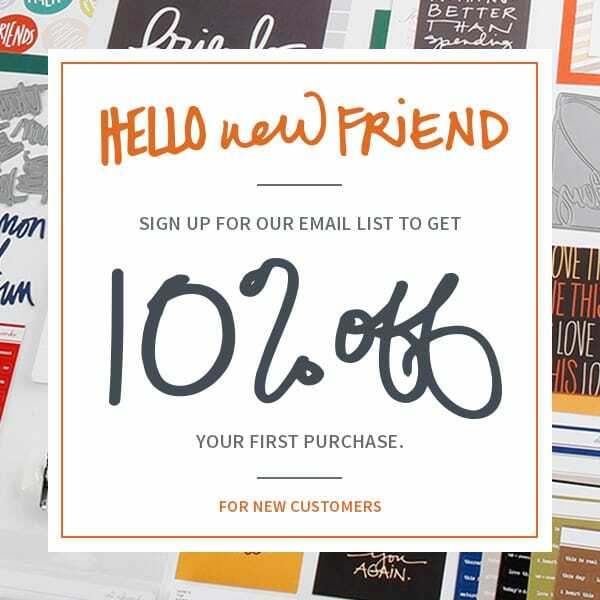 Also check out their selection of freebie digital downloads. 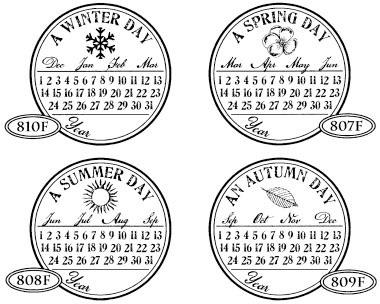 One person will receive the four lovely season stamps shown above. Catslife Press has a great collection of new wood-mounted stamps available. Read more about Susan and her company here. 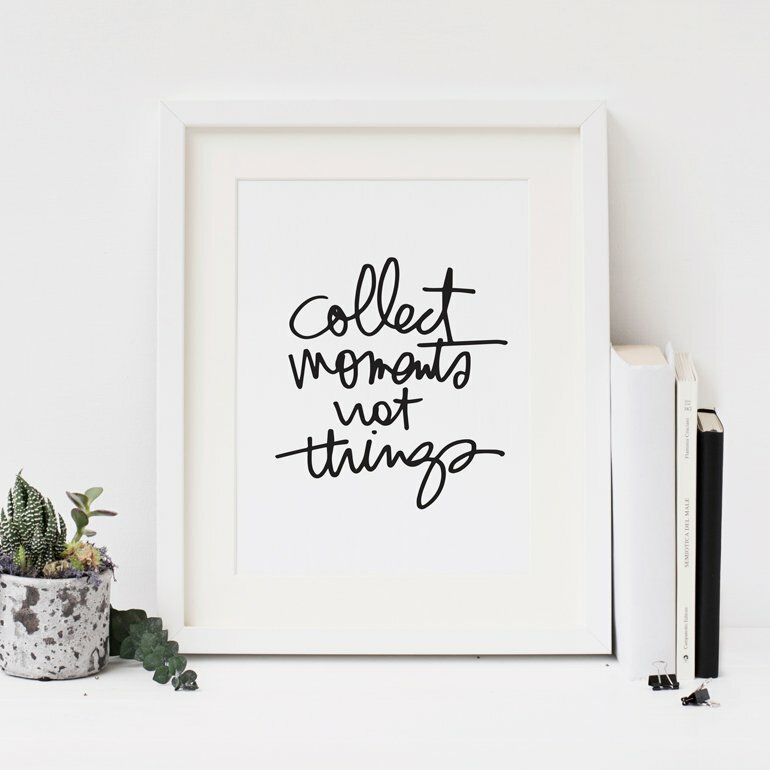 To be entered into the drawing today leave a comment answering the following: how often do you scrapbook (if you aren't a scrapbooker, how often do you get a chance to spend time on your hobby/creative passion)? Comments will be closed tonight at 8pm Pacfic (see below) with the winners posted shortly after. EDITED: the drawing will be at 9pm Pacific tonight :). I probably scrapbook twice a month. I would love to do once a week but my schedule just is not allowing it - or better yet I do not know how to fit it into my schedule. Right now I am scrapbooking about twice a week but it is in my thoughts every day. I love it! I spend a lot of time going through photos, editing and just enjoying them. I used to scrap several times a month now I'm lucky if I get to scrap at least a few times year. I really need to get back into it. I get to spend time scrapbooking for a few hours every week. It's not enough but with 2 little kids I'm grateful for the time I do get. I scrapbook in my head every day! It is my dream to get something on paper everyday. I also keep a journal in my purse that I write in often. Have a blessed day! Usually about once a week, on the weekend. Wish I had more time to! Going to an Expo later this month that I'm looking forward to, so more time this month! I usually sit at my desk and scrap 2 or 3 times a week, maybe more, but I only finish a layout once every week and half/10 days (I'm a short spurt scrapper, lol). That's ok for me though, it's more about the time spent than the actual results. Most of the time I can squeeze it in everyday even if its just a few minutes. Although I do scrapbook, I find myself making paper goods like cards and gift tags more than I actually scrapbook. I do some type of craft each day - I'm an empty nester so I have more time now than I have for the past 20 years! I love to spend time on crafts, and it's a sad day if I can't squeeze in some craft time. I love to scrapbook but currently I am lucky if I can a couple of hours a month. Tough to fit it in. Not nearly enough! I think about it everynight and plan journaling and photos and layouts in my head. But acutally putting adhesive to paper...maybe once or twice a month. lately its been more frequent. as in a little here and there all week. i'm currently doing 6 projects. 2 baby books, 2 wedding present albums and 2 currently for myself. 1 digital and 1 hybrid. so between babysitting, 3 kids and a whole house to take care of, i amazingly find time to do it. i can work 5 days a week and get a little done at a time or i do long periods of time and only do 2 days a week. either way, all my projects are right where they should be and i don't feel behind. i just try and make it work. not to mention i did an easter mini book and a 50th celebration mini book for my father in law. whew! I have my scrapbooking/paper crafting table set up right in the living room and can usually sit down to do something at least 3 or 4 times a week. It's how I unwind in the evening. While my husband watches the news, I snip and scrap and paste and glue to my heart's content--having an empty nest is not so bad after all. I try and scrap every day. Sometimes it is just working on a page in an album but most times I am creatings "something" everyday. A day is not complete unless I actually sit at my desk and do something! Going digital has enabled me to scrap on my laptop without dragging out my things or sequestering myself in my scraproom. So that lets me scrap while still interacting with my family. Still, I only make an intentional effort once a week on Sunday evenings. Though I confess to surfing for kits and inspiration daily! i scrapbook continuously, i have several albums that are on-going throughout the year of what i have been doing, one for special trips, both of my boys have one of stuff that's "just about them". 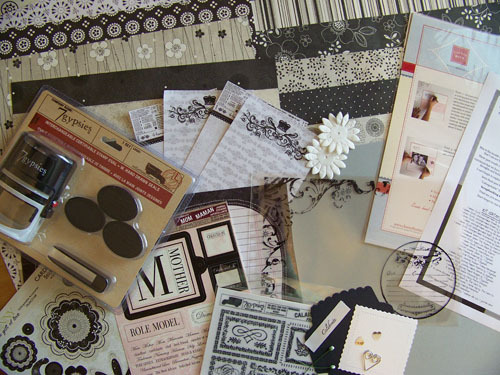 i also enjoy cooking, quilting, and knitting, so my actual time spent scrapbooking can be a bit sporatic. There are three days a week when I definitely don't get to be creative, but on the other days, if I can fit in some card-making or stitching, I will. I do something with scrapbooking or photos nearly every day. I have a desk set up in our family rooms, so I am not isolated from the rest of the family. It makes for a messy room...but the togetherness is worth it. I LOVE all the giveaways today!! Live what you love--and sometimes life just comes at me too fast. I am trying to focus on journaling to capture words or thoughts EVERY DAY...and trying to take more pictures. As our Wisconsin days turn warmer, my garden is my scrapbook and I mulch, weed and reflect every chance I get! It's raining today, and new plants are unfolding before my eyes....I love playing in the dirt. At least once a week. I am fortunate enough to have a scrap space in the basement that allows projects to "sit out" at all times. I go down every morning and look at them. I get to "touch" them and "work" on them a couple of times per week for a short time (usually before work...I am exhausted after work). It is the best part of a day and a much needed creative outlet! I haven't scrapbooked in a long time, busy with work and family but I really miss it and need to get back to it. I do try to still make cards and gifts for special occasions and just finished making my sister's wedding invitations for her big day in June! Love giveaway's and hope you pick me! I am trying to keep up with the Project 365 idea. I try to make a journal card at least every other day. I do full layouts whenever I feel inspired or get new products, which is about once every couple of weeks!